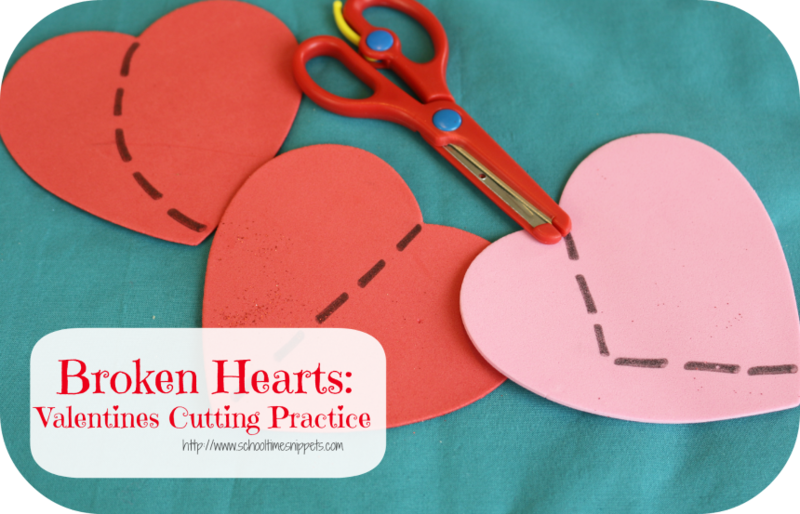 Valentine's Day foods and crafts are ALL over the web my friends! Are you feeling the lovey-dovey goodness?! 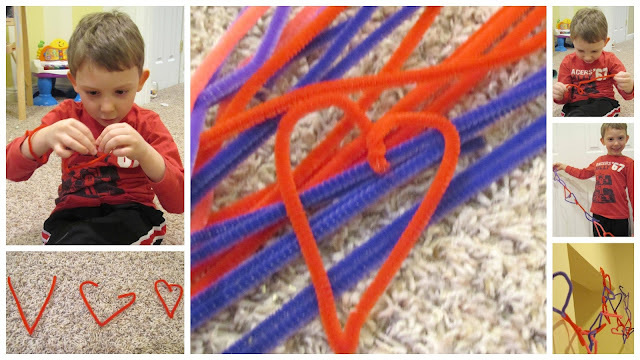 A couple days ago I shared our Valentines Sensory Bin and today I've got 3 Valentine's Day Crafts that my son (and daughter) had a hand in creating! Easy "Invitation to Create" activity with a Valentine's twist! Just set out paint, paper, and cookie cutters and have fun! 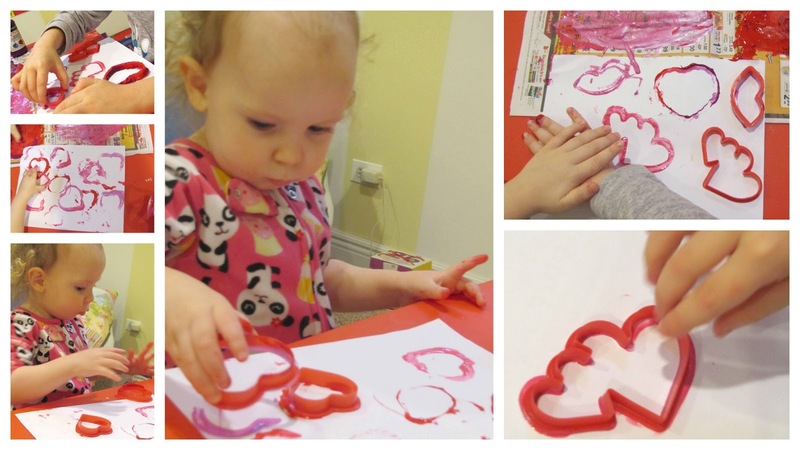 Have your child dip the cookie cutters into the paint and press them onto the paper. Fin all the purple, pink, and red pipe cleaners. First bend the pipe cleaner into a 'V'. Next bring in both sides and twist them in the middle. This is a bit trickier than it looks and I lost my buddy a few hearts into this activity, but I love the way it turned out! I penciled a heart shape onto the canvas and then had Big Brother fill it up with the scrap paper. We separated our mosaic into colors, as I think it helps make the heart 'pop'! This was another tag-team project, but he stayed with me pretty much the whole time on this activity! If you need some more Valentine's Day Ideas, here's some more! 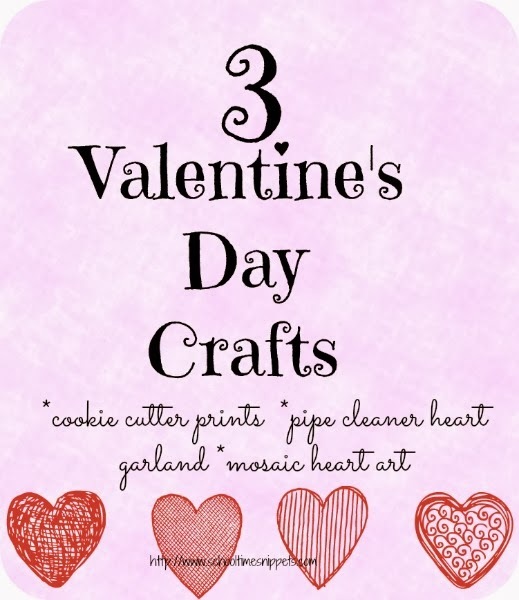 or check out my Valentine's Pinterest Board! !